When I finally broke down and purchased an Instant Pot® Ultra, I no longer needed to babysit my yogurt. My new electronic nanny now does all the work of keeping track of the temperature and making sure all the little yogurt bacteria are nice and warm, but not too warm. The only time I need to haul out my cooking thermometer is when I take the milk out to cool it down before adding the starter. 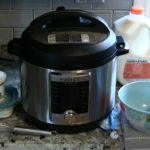 But even then, I don’t have to worry about the milk getting too cool since when I pop the inner pot back in, the Instant Pot® will bring it up to the right temperature and keep it there. If my Instant Pot is the equivalent Mary Poppins I think that makes the Kleynhuis Yogurt Stainer Pouch the Pampers of the yogurt world. 🙂 They work together in such a magical way, they may as well have flown into my kitchen by umbrella. Check out the method I use below, or you can also watch the video instructions on the Kleynhuis YouTube channel. Also, here’s a one-sheet summary of both my stove-top and Instant Pot Greek Yogurt-Making Methods. Here are the simple steps I use to make yogurt from a gallon on milk in my Instant Pot® Ultra. Sanitize containers and utensils. Meanwhile, place 3 wide-mouth quart-size Mason jars, wire whisk, ladle, and canning funnel in dishwasher. Perform a “quick wash” cycle to sanitize everything. Cool milk to 115°F. After milk has finished heating, take the inner pot out and place in a sink filled with cold water and ice. Cool milk to 115°F. which takes about 15 minutes. Skim off any skin that forms on the top of the milk. Add yogurt culture. Spoon 4 Tbsp. of plain yogurt with live active cultures into a medium bowl. (1 Tbsp. of yogurt per quart of milk.) Pour 2–3 ladles of the lukewarm milk into the bowl with the yogurt, whisk gently, then pour the mixture into the milk and whisk gently until the yogurt is completely dissolved in the milk. Save some for next time. You should now have made yogurt! Take out 4 Tbsp. of the freshly-made yogurt and store in a container to use as the starter for your next batch. Strain off the whey. Cover a large colander with a Kleynhuis Strainer Pouch and place the colander in a larger bowl. Carefully spoon yogurt into the lined colander. 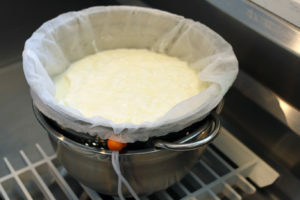 Strain for 2 hours to create thick yogurt. Strain over-night to make very thick Greek yogurt. Experiment with straining times to find your perfect thickness! Saving/Mixing. If you would like to save the whey, pour the whey from the bottom collection bowl into another container and store in the fridge. Then spoon the strained yogurt from the colander into a mixing bowl. If you like sweetened yogurt, add 2–4 Tbsp. of your favorite sweetener (organic sugar, honey, etc.) and 2–4 Tbsp. of vanilla extract. 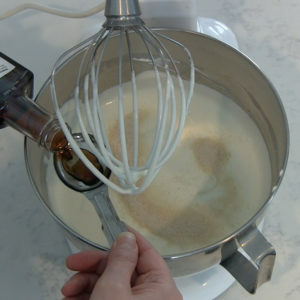 Whisk in mixer for 5 minutes until smooth. Ladle yogurt into mason jars. 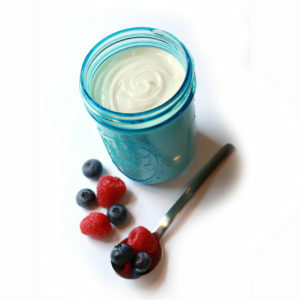 Carefully ladle or pour yogurt into Mason jars using a canning funnel to prevent spilling over the side of the jars. Depending on how long your yogurt was strained, you should fill 2–3 quart-sized Mason jars. The yogurt will thicken as it chills in the fridge. Enjoy!